Rory McIlroy admitted he’ll have to work on his putting if he’s to challenge at this year’s Masters. 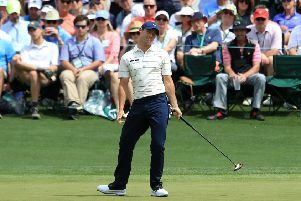 The Holywood man carded a one-over-par 73 on day one at Augusta National, Georgia, following a round that contained six bogeys and five birdies. But the 29-year-old, who admitted he’s adopted a regime of meditation and mind-training in the build-up to this week’s Masters, said extra work on the practice greens should enable him to tackle the issues he had during the first round. “I’m going to go to the putting green and try to figure this out. “I over-read a few early on, and then I started to under read them coming in, so just try to work on that a little bit. “I think just whenever the greens are a little slower, they don’t break as much. “The greens are maybe two or three feet slower than they usually are, just because it’s been so soft and the rain. As McIlroy posted a 73 on day one, playing partners Rickie Fowler and Cameron Smith carded rounds of 70. The group will resume matters today at 7pm and the Holywood ace is confident there’ll be enough chances for him to get among the leaders. “I think I’ve sort of been through it all here at this golf course, so it’s fine. “You know you’re going to have chances. There’s birdie opportunities out there and I have to take those chances. “I can accept some mistakes, but six bogeys out there is a little too many,” he added.